AOA-accredited residencies with ACGME pre-accreditation include: Orthopedic Surgery Residency. 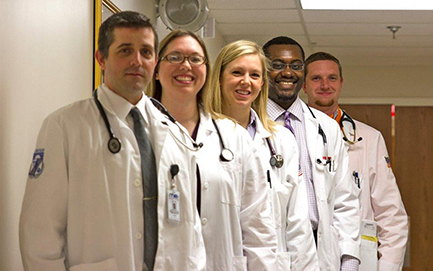 We also offer ACGME-accredited residencies in: Internal Medicine, Psychiatry Residency and Family Medicine. AOA-accredited fellowships in Gastroenterology, Sports Medicine Fellowship, Geriatric Medicine, Neuromuscular Medicine (OMM), Child and Adolescent Psychiatry Fellowship, and Pulmonary/Critical Care Medicine Fellowship. An accredited fellowship in Integrative Medicine Fellowship and a Podiatry Residency are also offered. Education Allowance: Residents receive $1,800.00 for continuing medical education which can be used to participate in extramural education seminars or the purchase of books, subscriptions or other scholarly materials. Residents take the ACLS Certification course at Millcreek Community Hospital, at no cost. Free Membership to the LECOM Medical Fitness & Wellness Center. Relocation Allowance: Incoming Residents are granted up to a $1,000 relocation allowance to facilitate the move to Erie, PA. There is a wide range of rentals or home options in both urban and rural settings. Hospital subsidized housing is also available. The Millcreek Community Hospital staff will be happy to assist you in finding accommodations to suit you. Insurance: Residents receive malpractice, medical, dental and life insurance at no cost. The malpractice insurance provides coverage 24 hours a day, 7 days a week. Medical insurance for the Resident and his family is provided. A pharmaceutical plan allows prescriptions to be filled by the Hospital s Pharmacy at a reduced rate. Life insurance is equal to one year’s salary. On-Call Meals: Residents receive all meals while on-duty and while on-call at Millcreek Community Hospital, at no cost. Their families are welcome to join them while on-call and receive the employee discount on all meals. Library Facilities: Millcreek Community Hospital has a well equipped medical library where residents may obtain computerized literature searches and copies of articles at no charge. The MCH Medical Library has an active interlibrary loan program with LECOM, Lake Erie College of Osteopathic Medicine. Residents also have access to the library at The Lake Erie College of Osteopathic Medicine. 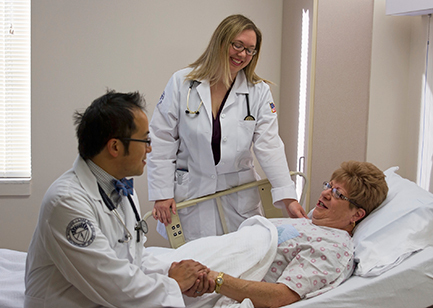 Master of Science in Medical Education: Participation in the Master of Science in Medical Education Program, offered by LECOM, Lake Erie college of Osteopathic Medicine, is a requirement of our Training Programs. Residents are required to complete the program, which is tuition free for our trainees, which results in a Master of Science Degree conferred during the Residency. In addition, the Master of Science in Health Services Administration and Master of Science in Biomedical Ethics are available to residents at a reduced tuition rate. Residents may be eligible for student loan deferment while enrolled in these programs. For more information on the program, or to complete the on-line application, please click here. Other Benefits: Residents are provided with three lab coats each year at no charge. Osteopathic Medical Students interested in applying to our programs should submit an application through ERAS (Electronic Residency Application Services), starting on July 1 of each year. If you would like to match with Millcreek Community Hospital, please provide your information through National Matching – for PGY-1 Applicants. Applicants interested in our ACGME-accredited Internal Medicine, Family Medicine, and Psychiatry Residencies should apply through the NRMP. Gastroenterology Fellowship applicants and Geriatric Internal Medicine Fellowship Applicants can apply through ERAS starting on July 1 of each year. Residents applying to our Sports Medicine, OMM, Geriatirc FM, and Child/Adolescent Psychiatry Fellowships and Residents wanting to apply to a PGY-2 Year (or beyond) are encouraged to submit a Residency/Fellowship Application (on-line application) to Medical Education, Millcreek Community Hospital. A copy of the Resident’s/Fellow’s board scores, transcript and at least two letters of recommendation are to be included.